Some decades ago, the decline of the vegetation caused by pest damage from wild deer has been an issue in Odaigahara Plateau where a rich ecosystem is preserved. To restore the natural environment in Odaigahara Plateau, the Ministry of the Environment established Odaigahara nature restoration promotion plans in 2004 with the goals of controlling the population of deer and preserving, restoring, and promoting sustainable use of the forest ecosystem and biodiversity. 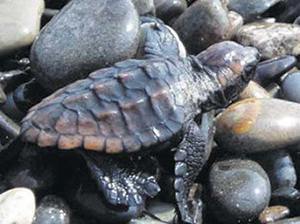 Shichiri-mihama and Oujigahama Beaches are valuable egg-laying sites for the loggerhead turtles. During an egg-laying period, local residents go on patrol early in the morning to engage in protection activities. Sometimes the eggs of loggerhead turtles immediately after hatching are crushed by cars entering the beach. In order to reduce such incidents, vehicles are restricted from entering the beach area during the egg laying and hatching season, which extends from May to September. 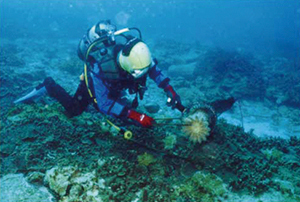 Since 2004, the Kushimoto coastal area has experienced damage to the corals from the crown-of-thorns starfish. With the cooperation of local government and divers, research and the extermination of crown-of-thorns starfish and spiral shells have been implemented to protect the valuable coral reefs and to conserve the coastal landscapes.